By now, my love of baked oatmeal has been well established. Truth be told, I hold back some of my variations because I don’t want to over-oatmeal people. I think the time has come, however, to release another! My sister-in-law, Melissa, is to thank for this delicious creation. She is a nurse who leaves early for work and likes to bring her breakfast with her to eat while on break. She thought a combination of my blueberry coconut almond baked oatmeal and crunchy top apple and cinnamon oatmeal would be perfect for her in terms of flavors and quick prep. This recipe is fruitier than my original apple cinnamon baked oatmeal and does not require the “soak” time. When I eat this version, it truly reminds me of a healthy apple crisp, hence the name. By the way, when Melissa makes this, she prepares it the night before and takes the whole baking dish to work to share with her coworkers. Wouldn’t you love to work with her? Note to all the quinoa fans out there: A couple of times, I have experimented with this recipe, using a combination of quinoa and oats. For our tastes, 1 3/4 cups oats and 1/4 cup quinoa (both uncooked) is the perfect combination. My kids don’t really notice a difference but I detect a hint of nuttiness. I have gone as high as one cup oats and one cup quinoa and recommend this for the true quinoa fans. In that case, I prefer a layer of bananas underneath (as described below) which will serve as a good base for the somewhat looser quinoa grains. Also, a special thanks goes out to my dear friend, Jen. She noticed that I often strategically place a tea towel or napkin in my photos–this is my way of improving the picture!–and she gave me the pretty one in the photo above. For those who used to watch The Cosby Show in the 80’s, I told her I will be to tea towels what Bill Cosby was to college sweatshirts! Ok…I just really dated myself there. Sometimes, I line the bottom of the pan with a couple of bananas, sliced into coins. Serve warm, as is, or with a dollop of Greek yogurt or a drizzle of warm milk, if desired. Preheat oven to 375 degrees and butter the inside of a 9 x 13-inch baking dish. In a large bowl, mix together the oats, 1/4 cup of the almonds, baking powder, cinnamon, and salt. In another bowl, whisk together the maple syrup, milk, egg, coconut oil or butter, and vanilla. Sprinkle half of the apples over the bottom of the baking dish. Cover the fruit with the dry oat mixture. Slowly drizzle the milk mixture over the oats. 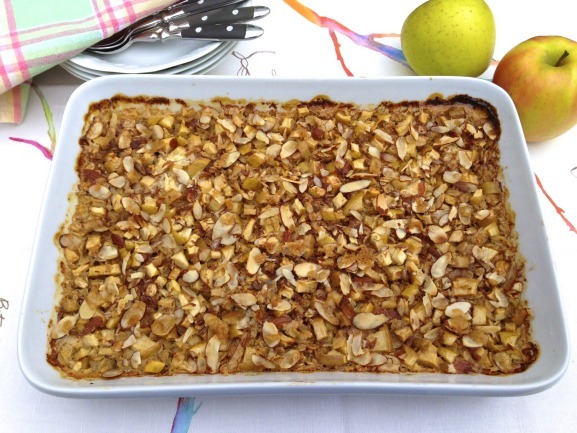 Scatter the remaining apples and almonds over the top. Sprinkle with the brown sugar. Bake for 40 minutes or until the oat mixture has set. Remove from the oven and let cool for a few minutes. This may be eaten immediately or made ahead and reheated. Store leftovers in the refrigerator. I like to use a mixture of apples. This time, I used one Fuji, one Honey Crisp, and one Gold Rush. Overall sweetness will depend partially on the type of apples used and on personal preference. If you aren’t sure the first time how sweet you’d like the baked oatmeal, err on the low side as you can always add a bit of brown sugar or maple syrup when serving. When using melted coconut oil or butter, it is helpful if the cold ingredients have come to room temperature prior to mixing so that the oil or butter doesn’t re-harden once stirred in. If this happens, you may slowly heat in the microwave until the liquid mixture is just warm enough to soften the butter or coconut oil. This sounds like a wonderful breakfast. I think I might give it a try in the morning. I also like the addition of quinoa with it. Thanks for sharing on Foodie friends friday and remember to come back and vote on Sunday. I hope you enjoy the recipe, Marlys, and I was happy for another visit over your way! Thank you, Terra! My boys are already asking for another round and I am only too happy to eat this breakfast frequently! Ann, another fab recipe! I am thinking I will make this tomorrow. It looks so yummy and no need to let sit.. Can’t wait to try it, and I will use the quinoa/oats combo. I am so glad you are back in the kitchen, Mary Lou, and hope you like this recipe!! Thanks for sharing it at Wicked Good Wednesdays, Ann! I am thrilled you made it and I can’t wait to see your post, Lynne. Thank you for letting me know and I look forward to another delicious Wednesday!! I made this today and its just great. Added some nutmeg and a dash of pumpkin pie spice. This is fantastic. Thanks so much for the great feedback, Janet. I am so glad you enjoyed…the extra spices would be delicious! My daughter is allergic to nuts. Should I add anything to replace the nuts? I add nuts for the crunch and added flavor, but you may absolutely omit them. As an option, you could substitute an equal amount of something like raisins or dried cranberries if you think that sounds good. I hope you enjoy! Thank you for your lovely message, Susan. I am not sure which baked oatmeal recipe you were looking for, but following is my “original” recipe if that is the version you first enjoyed. They are different spins on the apple option…and there are still more seasonal varieties which you can find in the breakfast category! Hello! Looks good. What does old-fashioned oats mean though? Does this mean like steal cut oats and not the Quaker quick oats? Seems like steal cut would not cook in the oven? (They take a really long time on the stove!) Any clarify is appreciated. Thank you! Old-fashioned oats are sometimes called rolled oats. They are the kind that take 5-minutes to cook. So, if you aren’t sure, just look at the cooking instructions on the package to see what the recommended cooking time is. This type of oat will produce the best texture in this recipe. I hope this helps and that you enjoy! This Apple Crisp Oatmeal recipe is FABULOUS! Yay! Glad you like, Mindy! Thanks for the great feedback, Yolanda…so glad you enjoyed! Just made this. Very delicious!! I didn’t have any almonds so I left them out. Used 4 cups of previously frozen apples. Yummy!! I’m thrilled you liked, Sonia, and what a great way to use your frozen apples! Do you have the nutritional information for this recipe (calories, fat, carbs, protein, sugar, etc.). This was delish! Thank you for sharing the recipe! Hooray! Thanks for letting me know, Denise.